Welcome to Make it in Minutes Monday. I thought it would be fun to feature quick and easy cards and projects that take only minutes to make, but look like you spent more time making them. I was inspired by cards designed by Jennifer McGuire. I cut the flower shape (#2064) that I purchased from the Silhouette on-line store out of the middle of a piece of white 4.5 x 4.5 inch cardstock. You could use a Cricut flower image or die. Next, I repeated the process using blue, green, orange, and pink cardstock. I saved all the cuts and made several cards, which you will see posted in the coming weeks. I covered the back of the white 4.5 inch square piece with a piece of blue card stock, and then inlaid the green, pink and orange petals. It took a few extra minutes, but it was worth the time. I cut the rectangle stitched white frame using one of my dies and attached to the white square. I used dimensional tape to attach to a 5 x 5 inch pink top folded card. 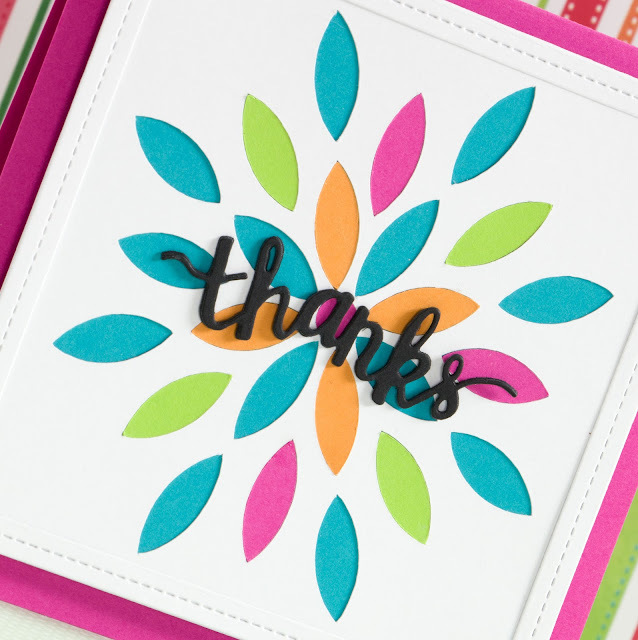 Lastly, I cut the word thanks three times, using one of my dies and glued them together before attaching to my card. I love how this card turned out. You could also use your Silhouette or Cricut to cut the sentiment, if you didn’t have a word die. I used the green 4.5 inch square that I cut earlier and attached a piece of white card stock to the back. I cut the rectangle stitched green frame and attached. Next, I attached the green square to a 5x5 inch top folded white card using dimensional tape. 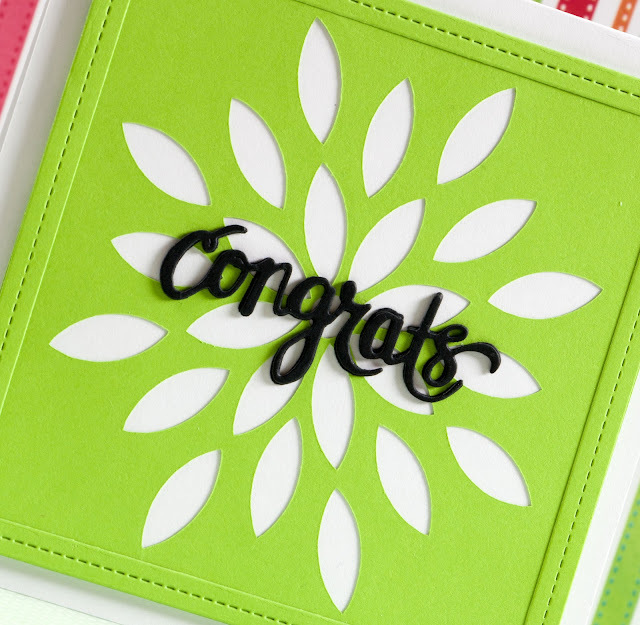 I cut the word congrats three times using one of my dies, and then glued them together before attaching to my card. Stay tuned, I used several different techniques for the remaining three cards! Gorgeous! Who needs to buy dies when we have our cutting machines? Love this! Happy New Year, Linda!!! 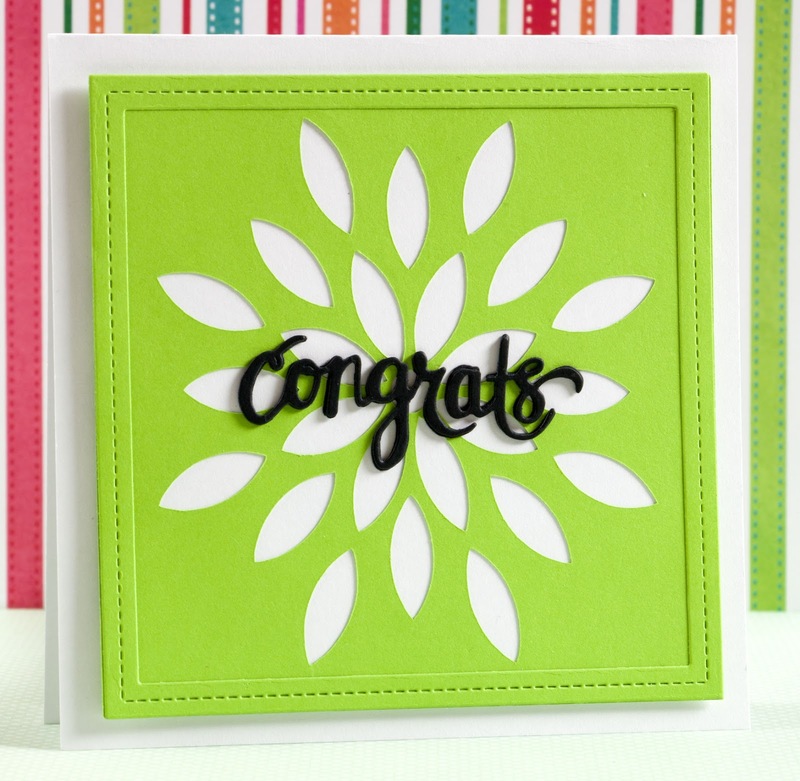 Love your cards - so simple but so very elegant! Thank you for sharing. I think this is the first time I have commented, although I love your ideas every week! 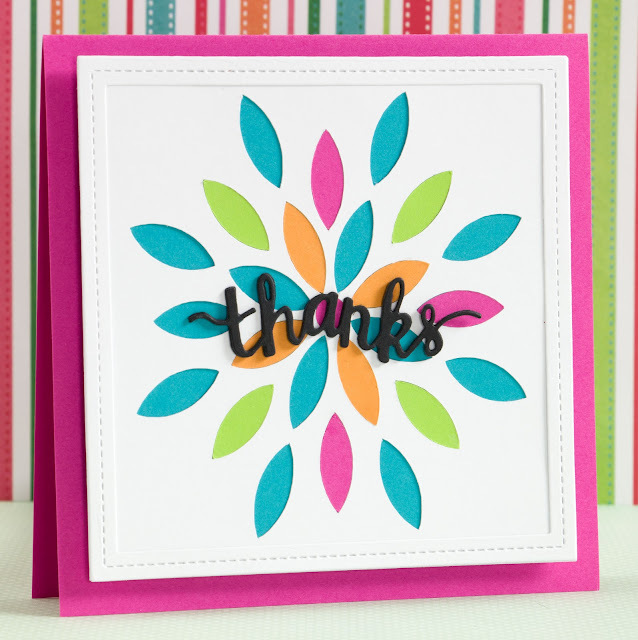 I needed a quick thank you card today to add to another more intricate card I was sending along very belatedly. Your post today inspired me to try a flower die from my collection, along with a couple of leaves and the word "hello", as I didn't have a die for "thank you". It came out beautifully! And I can make several more with the die cuts! So thank YOU very much for taking the time to post your wonderful ideas.